Today is my first day back at my desk here in Vancouver after a lovely week in the Canadian Rocky mountains. While at the CWC/Corus Digital Media Career Accelerator program, I enjoyed the best green tea I’ve ever had in my life. The brand is “Higgins & Burke” and this is the only green tea I’ve tasted that hasn’t given me a bit of nausea after drinking it. I must have it here at my home office! I have always been under the impression that “and” and “&” were “stop words” that had no influence on search results, since search engines would strip them out of the query. Yet I have always found a variance in results when I actually search with and without stop words and characters. The second result with the title tag “Site Map” slips to 5th position. PS: “Site Map” is possibly the worst title tag I’ve ever seen. 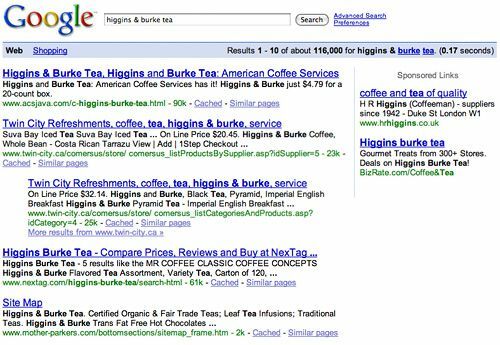 Higgins and Burke Tea: American Coffee Services has it! <- reassures that you can purchase from this website, not just read catalog information. Higgins & Burke just $4.79 for a 20-count box. 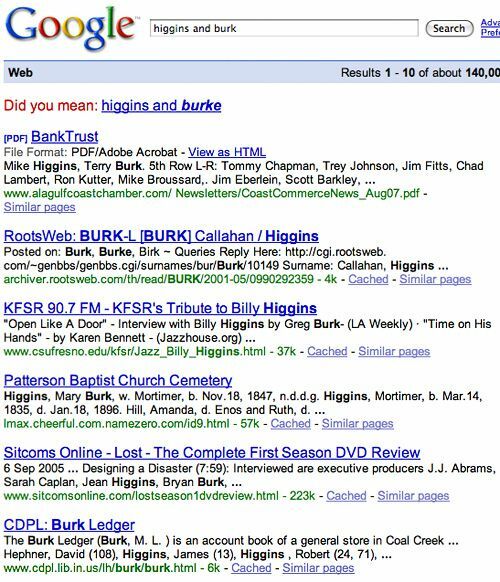 <- a technique used by pay-per-click marketers, showing a price and quantity encourages click through and increases conversion rates, as searchers only click through when the price is acceptable. This also reassures the customer that this tea can be bought individually, not only in wholesale quantity. 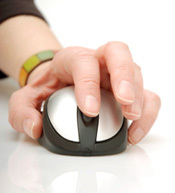 The URL is also the cleanest, containing only keywords - no unnecessary characters, folders or parameters. Another observation I made is that Google’s Shopping results appear at the bottom of the organic results today (this may be Google experimenting with it’s results strategies, as Matt from eCommerce Optimization observed last week). 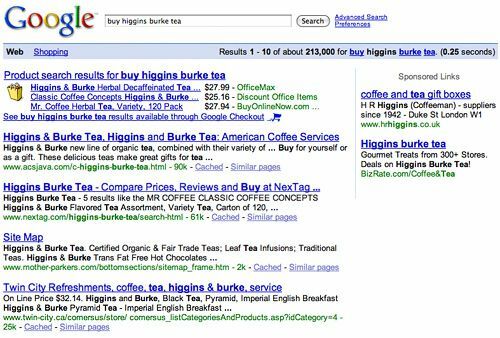 However, when you type “buy Higgins & Burke tea” which signals an intent for an ecommerce transaction right now, rather than researching the product for comparison, Google Shopping links appear at the top where we’ve come to expect them. What do you know? OfficeMax sells this tea. 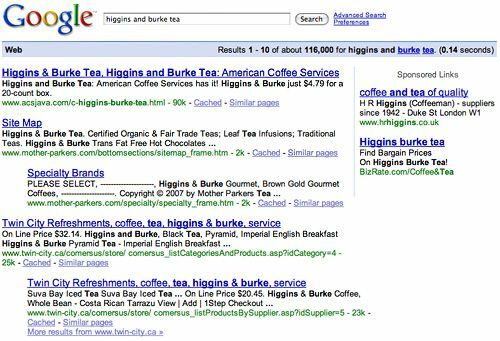 These are great keyword opportunities for PPC that I don’t see any of these etailers capitalizing on – not even BizRate! It could be that their campaigns are geotargeted and exclude my region – but ads appear for the correct spelling, so I suspect these retailers haven’t thought of it. 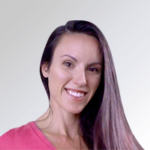 Next articleWhat Do Customers Really, Really Want?